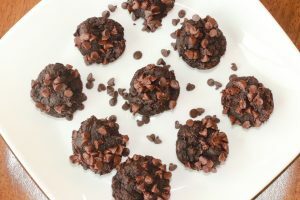 Today I’m making my Healthier Double Chocolate Brownie Bites. To be honest, I have a serious sweet tooth. Sometimes I just crave it and for me trying to substitute an apple or orange just doesn’t cut it. Since I’m working on making healthier choices.. I was thinking about what I could make that would fufill that chocolate craving and still be on the healthy side. For this recipe I’m taking the idea of a double chocolate chip muffin crossed with a gooey chocolate brownie, substituting coconut flour, & using avocados, zucchini, and puréed apples for extra nutrients and moisture! Spray a muffin pan with non stock spray. 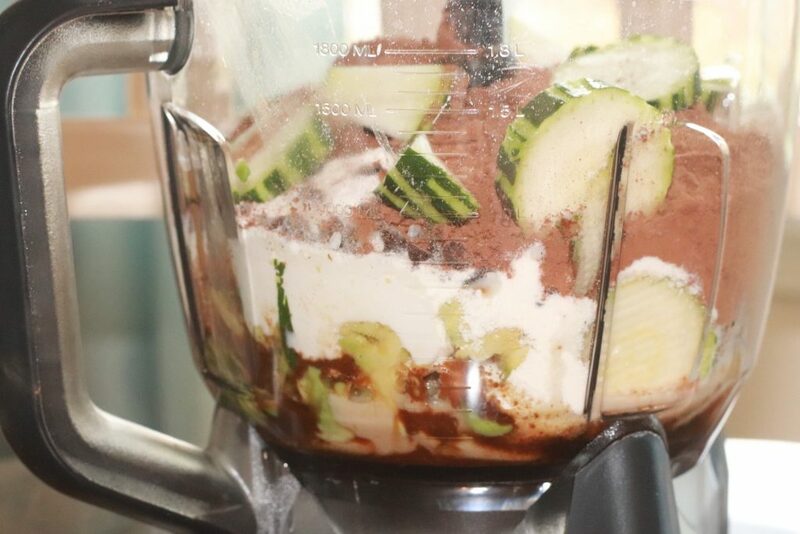 Now combine your pureed apples, eggs, greek yogurt, & zucchini. I'm combining them straight into my ninja blender. Than I'm adding the coconut flour, cocoa powder, avocado, olive oil, coconut sugar, & milk. Add the salt, baking soda, vanilla, & cinnamon. 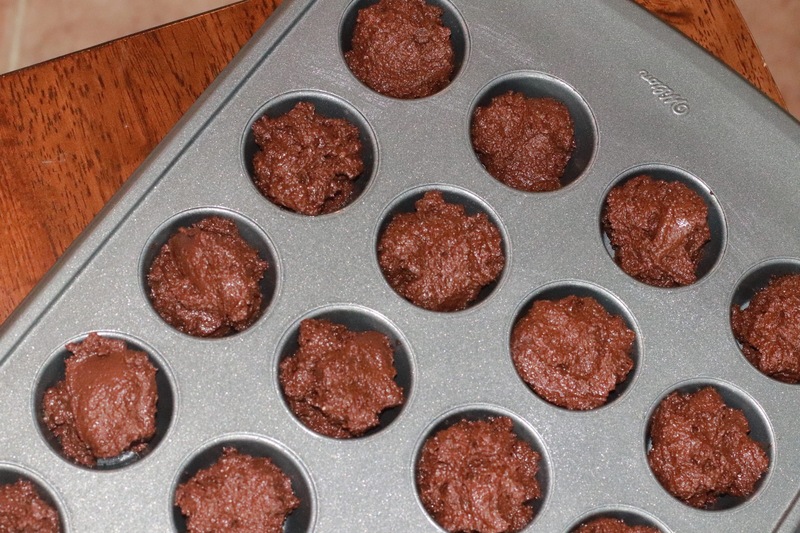 Portion them into your muffin pan , a scoopful in each individual spot. Finally top it with a spoonful of your chocolate chips. Place it in the oven and let them cook for about 14 minutes. When you think they're done test them with a tooth pick. Stick it in the middle and if it comes out clean its done. I do not have any gluten allergies, and I do eat it quite often. However, I’m really TRYING to cut it out of my diet as much as I can. I just feel better all around when I limit it to once or twice a week. Plus, I’ve noticed eliminating it is one of the components that helps me to lose more weight. Instead I’m using coconut flour, which I love baking with. However, it’s important to note when cooking with coconut flour, it’s more absorbent. It will leave your items more dense if you do not make the proper adjustments. To offset that, my pureed apples and greek yogurt will add moisture. While these taste like a brownie, they are so much healthier, you could even eat them for breakfast if you wanted! These sound so good! I will definitely be trying them soon!!!! OH MY GOODNESS these sound delicious!! 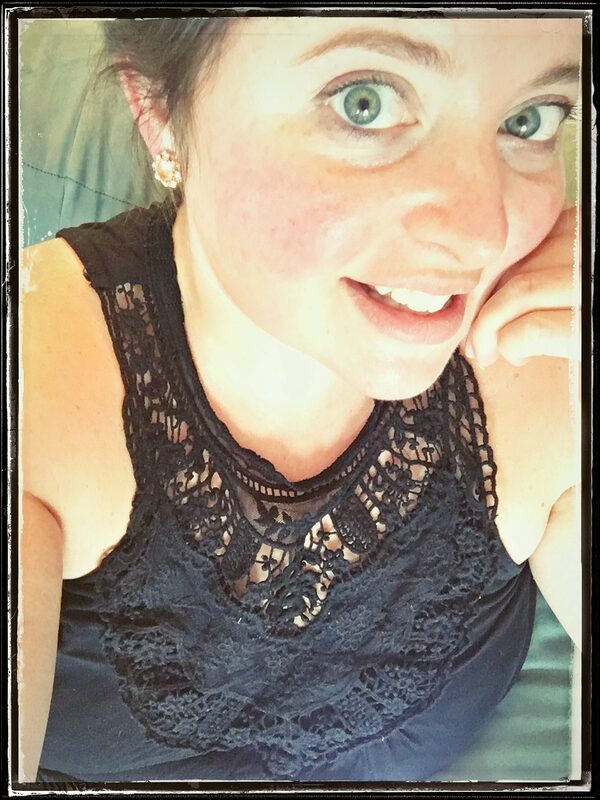 I am currently gluten free for weight loss and have a SERIOUS sweet tooth! I make black bean brownies which are fabulous, but need another chocolate treat and I think I may have found it! I can’t wait to make these!!! I also substitute white sugar with coconut sugar, great alternative. Thank you! Yes, New resolutions are so hard. It makes it so much easier if you can still eat food you love! Thank you for the recipe. I’ve been looking for a healthier alternative to brownies, and these are perfect! These look delicious! I hear you…when I want a cookie, I want a cookie. A banana doesn’t kill the craving! I am looking forward to trying these and few more recipes on here that have spiked my interest! Yes! They are the perfect ingredients for brownies! OMG, these look so delicious. The best part is, I actually have all the ingredients in my kitchen. I love how you wrote out the directions, super easy to glance through before starting and then to follow. My kids will be thrilled to find these in their lunchbox tomorrow. These look delicious! I can’t wait to give them a try!